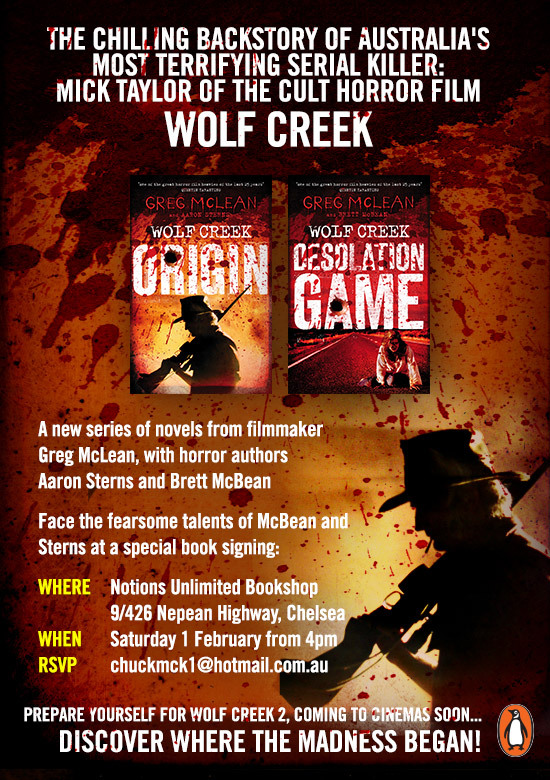 To celebrate the release of Penguin Book’s Wolf Creek prequel novels, Notions Unlimited Bookshop is hosting an official launch party. Come and meet writers Aaron Sterns and Brett McBean, get your copies of Origins and Desolation Game signed, down some libations and mingle with other Mick Taylor fans. Date: February 1st 2014, starting at 4pm. For more information about the event, click here. Hope to see you there! This entry was posted on January 24, 2014 by brettmcbean. It was filed under Genre News .